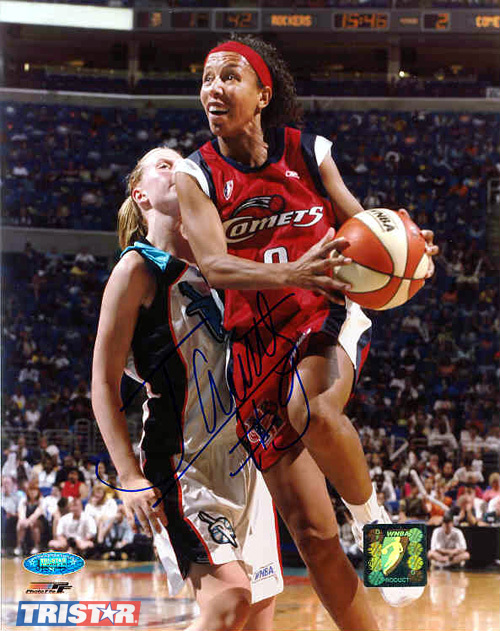 Janeth Arcain autographed, hand signed Houston Comets 8x10 photo. Janeth Arcain is the most recognizable WNBA player ever to come out of South America. As a former Olympic silver and bronze medalist, Janeth would agree that her biggest accomplishment are the 4 Championship rings she won with the Houston Comets. Janeth Arcain has personally hand signed these 8x10 photos. Each Janeth Arcain autographed photo is guaranteed authentic, and includes an individually numbered TRISTAR Authentic hologram. You can verify the authenticity of your autograph by entering your hologram number online at www.tristarauthentic.com.